Mercedes-Benz V-Class Interior, Sat Nav, Dashboard | What Car? 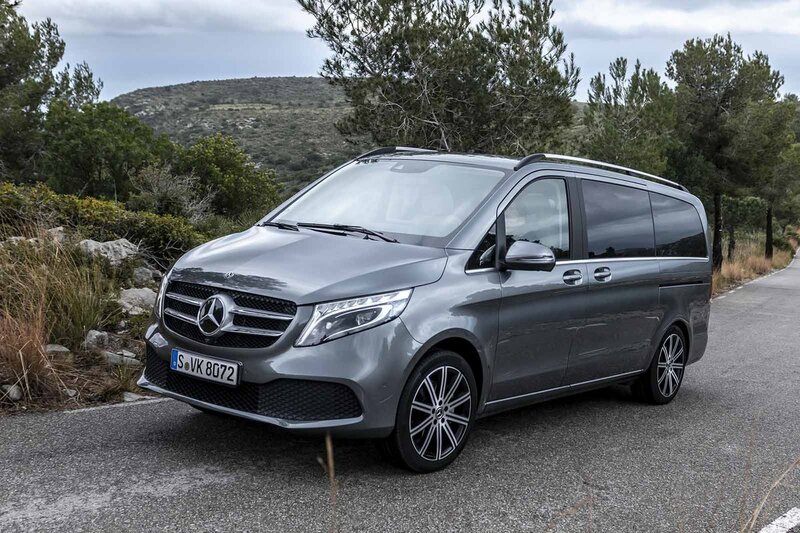 As with the VW Caravelle, the V-Class manages to pull off the transformation from van into business-class transport more convincingly than the cheaper Ford Tourneo. Standard Nappa leather seat trim and lashings of chrome dotted around, along with faux-leather across the dashboard, make it look and feel pleasingly smart. Because the switchgear is borrowed from Mercedes’ passenger cars, the buttons feel suitably substantial as well. Everything on the dashboard is logically arranged, making it easy to use, although that doesn’t extend to the confusing menus of the infotainment system. At least its high-mounted screen is clear and easy to see. The driver’s seat is set quite high and offers an excellent view of the road ahead. Deep side windows and large door mirrors also mean you can easily see what’s coming up alongside. The view behind isn’t quite so clear; the third row of seats hinder your vision through the rear screen. Fortunately, as all models come with parking sensors (front and rear) plus a reversing camera, this isn’t too much of an issue. The captain’s-type driver’s seat, with its folding armrest, feels comfortable to sit on but doesn’t provide much side support when cornering. Nevertheless, it and the steering wheel both offer plenty of adjustment, so it shouldn’t take you long to find a comfortable driving position.